Gary was out of town most of last week and even though Layla and I were going to a birthday party Friday night I made lasagna for the guys. I knew Gary would love a home cooked meal after being gone for the week. The lasagna turned out good and we all ate a big piece for dinner. Layla and I even had a slice before the party! Saturday afternoon we invited friends over to hang out for the afternoon and play some games. 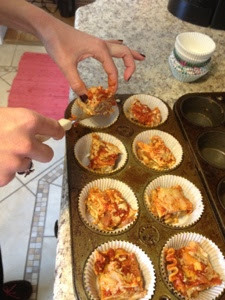 I decided to slice the lasagna into bite size pieces and make lasagna cupcakes. The cupcake liners worked great! 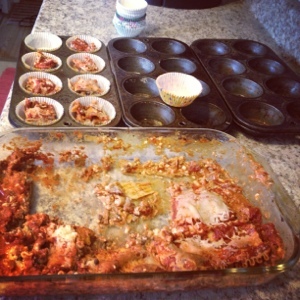 When we ate them Saturday night it was like eating a 'shot' of lasagna. It is a great way to finish up a pan of lasagna. Lasagna is always better the next day, so this was a win win! I mostly followed the lazy lasagna recipe I posted back in 2009, but I had some cottage cheese in the fridge that needed to be used, so I added it to the lasagna layering process. I love the flavor and consistency the cottage cheese gave to the lasagna. I definitely experimented when adding it in! Here's to a few shots of lasagna!